Pixie's Snippets Playground - Week 192 - PLUS free Ally Pally tickets!! Edit - Sally over at Crafty Salutations has two one-day tickets for Ally Pally (19th/20th September) to offer to one of her followers. You can go with a friend for one day or on your own for both days - it's up to you. All Sally wants is for them to go to a good home. My name is in the hat for sure - why not hop over and add yourself into the draw by 3rd September if you'd like to be innit to win it?! 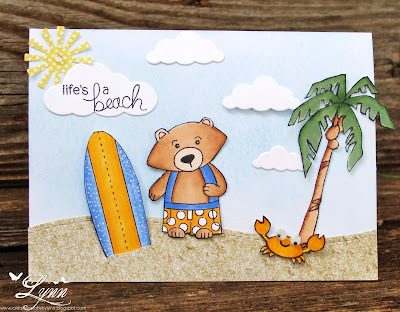 You just need to be a follower and leave a comment - plus Sally's blog is a fun place (she's a great card maker, especially backgrounds and scenes - swoon!). Back to the weekly blog post about Playground antics now - so what happened there then?! 92 entries this week - wahoo!! I couldn't believe it, as fast as I managed to clear the commenting, more of you arrived - what a wonderful turnout - and also what a headache doing the picks!! This great card, made by Jane, features a 'Penny Farthing' bicycle. It did cause a bit of confusion to one of our lovely USA Playmates, but Jane has explained it so well now in her post. I chose this card because not only did I love it at first sight but also because it's a perfect card for a chap and I'm aware that I don't tend to feature those as much as I should! 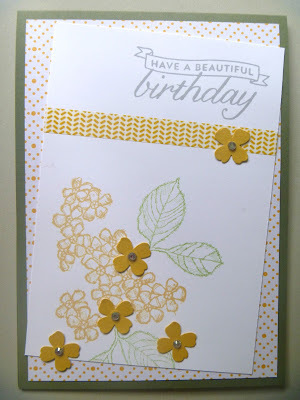 I chose this card by Em because the design is so eyecatching, and also what a fabulous way to use up 'snippet strips'! One to try for sure - I just bet mine wouldn't be as evenly placed though! Our Kath ('Plain and Simple' blogspot) made this great card featuring Rudolph. It's a great card to begin with - but what a clever idea to use brown paper (from a paper bag) to paper piece Rudolph's face. Brilliant! Hettie (aka Sam) has been busy doing other things lately but she did manage to hop into the Playground with this beautiful Christmas card - I chose it because I think it's really beautiful, plus Sam also stamped the patterned background layer. I'm so pleased that I managed to include a card from Karen (Ladd) at long last. For ages I've wanted to, but didn't think I could as Karen uses Flickr. The other day, when I saw this great scene, I sat and worked out that I could download it, then save it to my own hard drive and then upload it from there! Wahoo! It takes a bit longer than just the copy and paste I can do from blogs - but really happy that you get to see this great card! This is a perfect CAS card, made by Jenni. Fabulous water colouring and such a fresh looking card! I just hopped over to pick up the image and also the link back to Jenni's - and spotted that Darnell had predicted that this would be a 'weekly pick' in our Playground roll call! Too right - it's wonderful! 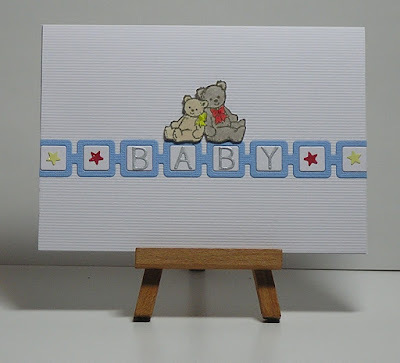 I know that loads of you have fallen in love with this gorgeous card, made by Sarn. I absolutely love it to pieces, wonderful colours, great design (isn't the sentiment perfect?!) and most of all I just totally adore how Sarn has used her Memory Box 'Modern Landscape' die by using the two halves in different colours. Genius! 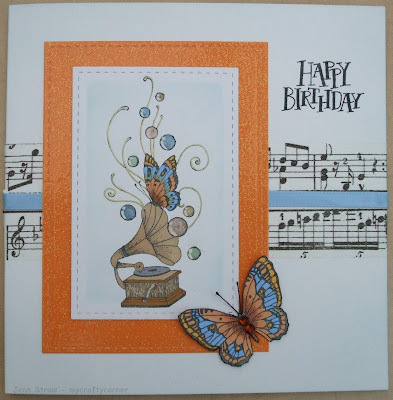 An awesome and very beautiful card, made by Carol. Quite apart from the fact it's a stunner with gorgeous water colouring, I wanted you to see those leaves. Such a great idea, made by using a crimper! 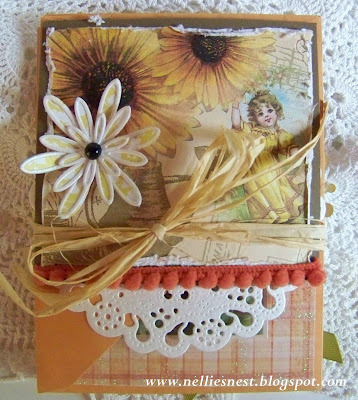 Here's a link to a tutorial that Carol made for Operation Write Home - way back in 2010! Sarah squeezed into the Playground just before the gates closed with this fabulous 'smooshed background' card. I think it's absolutely stunning - see how even the little hearts have been die cut from some of the background waste . Another of those cards which you just stare at and and wish you could come up with such a great design. I did giggle though, over at Less is More this week the challenge is to use sprays/mists. Sarah is of course on the DT and apparently managed to get spray (err) everywhere - including her walls!! So there you have the weekly picks - and I hung on in there and managed to do 10!! Jane J (I added the J as we already have a Jane) popped into the Playground twice this week. 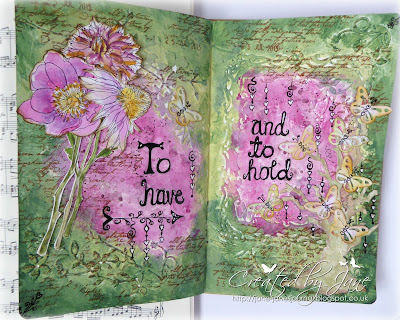 Her first 'show and tell' is this gorgeous journal double page - fascinating to see the 'step by step' as Jane made this too! 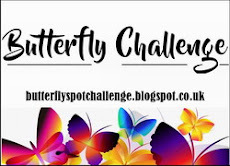 I've often come across Jane's lovely blog when peeking at challenge entries so am delighted we have a new playmate! I've been a fan of our next new playmate for ages! It's Brenda of 'Floral Fantasies' - yay! 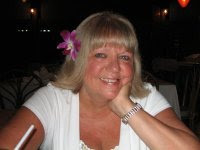 I'm sure many of you know that Brenda works tirelessly running several challenges - including Stamping Sensations, Allsorts and Penny Black and More. I totally love this card, so soft and gentle. Wonderful pale, softly sheened mistletoe and I truly thought at first that the sentiment had been stamped - in fact it's a wonderfully intricate Tattered Lace die cut! Well done Shaz! It's a while since your last win (about a year) so this was certainly due! I have your address and will post your prize off to you ASAP this coming week. The Snippets Challenge will run for one week and the Playground gates will close at 11am UK time on Saturday 5th September. The gates will open again at midnight UK time on the same day. Maximum of three entries and please say in a comment if you wish to play and be a possible winner of the prize. Also, if you already have one of them or aren't really interested in winning both of the packets of stamps but still would like to play for just the one - please say so and if your number is picked as the winner then I'll do a second draw for the other one. However, the prize IS for both items unless I'm told otherwise in a comment. Do remember that you should also link back to the Playground in your blog post to be eligible for the draw. The Uniko stamp set comes with both straight and curly 'lengths of string' stamps - I obviously used the curly one but flipped it the opposite way round for one balloon - and also made sure it looks as if the two strings are looped round one another. It's crisp and clean - and you can flip or rotate it. BUT, dozy mare that I am, I didn't spot the fact there's a sentiment in the bottom right corner until the point at which I'd finished my card(s) and was writing this blog post, sigh :( Then again, quite a few entries haven't followed the sentiment placement and a few of the DT cards haven't followed that either - phew - so maybe it's just optional? Whatever, I'm still hopping over to play as I hate to miss LIM and I totally love this sketch! So that's four more for the box, yay! - to finish off I added a gold peel off sentiment, at that point after what seemed like hours of work, no way was I gonna risk stamping and embossing in gold! And, although I do love this die, so much so that I gave one away as a Playground prize back in August last year, there's definitely a knack to using it if you want to fill in the candle and ribbon with die cut pieces. I think it looks really elegant with just the outline, but this time round wanted to experiment a bit. I've found the same problem it with some other dies too - if you're not careful when assembling the die outline and 'filling in' pieces, the outline could be slightly distorted which ends up causing problems with unwanted overlapping or even gaps. My way round this was to cut all the pieces I wanted to use, sort out what was what and line them up in little rows. Then, I carefully peeled off about a third of the protective backing from the adhesive which was on the die cut outline, starting from the bottom - and stuck that bottom third onto the card panel I was using. That gave me something of a starting point for the bottom half of the candle and two of the ribbon twists. Then it was just a case of carefully working up the length of the outline, peeling off about a third of the backing again, gently applying the outline and adding in the inserts - and the same for the top third. I just KNEW I'd read thoughts about using this die elsewhere, and just found it over at Cathy's blog. Her solution would work wonderfully well too - especially if you're gluing the pieces in place rather than using the sticky adhesive backing. I'd like to enter these cards into Rudolph Day for August over at ScrappyMo's, where it's always 'anything goes'. And of course, I deliberately used gold on the cards so I could play along over at Craftyhazelnut's Christmas Challenge this week (use some gold) - and I'm also entering into Craftyhazelnut's Christmas Challenge Extra for August, where it's also always 'anything goes'. 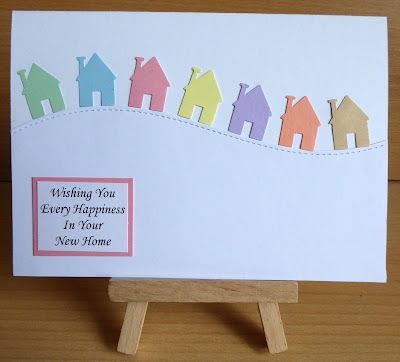 But, even just as important is that fact that our much loved Playmate Lynn found the time to make and blog this card. I posted here a little while back that Jim (Lynn's husband) had a stroke and I know that so many of you pitched in to send cards, keep Jim and Lynn in your thoughts and prayers. Well folks, Jim is coming along nicely - certainly out of hospital and I think also home from rehab. Your positive thoughts are still needed please - and even though Lynn is obviously shorter on free time right now to blog hop and comment in return - I bet she'd appreciate a little hello from you. AND, if you do hop over - please peek at this card too - I loved it straight away, but then rolled round laughing at the irony of the sentiment combined with the 'little blue bird of happiness' - I've never seen such a perturbed/disturbed expression on a bird! :) Lynn's sense of humour is still the tops! Isn't this a fabulously rich and beautiful card? 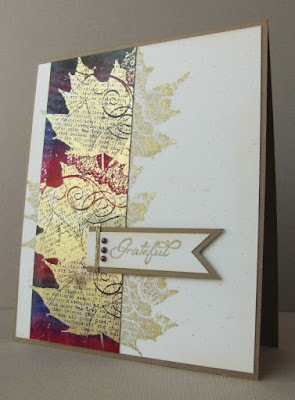 Made by Greta and I just think it's gorgeous - wonderful gold stamping on the brayered background. Perfection - there's just something so luxurious about it! The next couple of cards were brought to us by Playmates who are regular picks of the week - but there's absolutely no way I want you to miss these makes! Laurie blew me away with this card, everything about it is just so 'right'. See how the backing paper goes so well with the snippets tree? 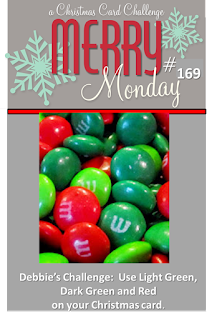 It's in the Merry Monday challenge link ups too and must be a winner for sure! 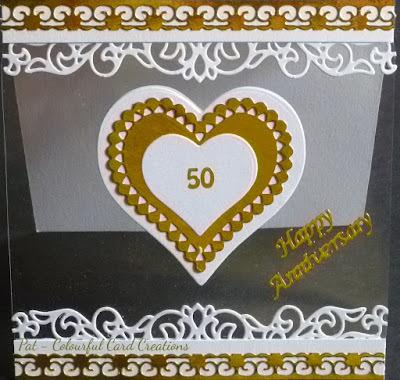 Pat is another one of our regular picks, and there was just no way this fantastic Golden Wedding Anniversary card wasn't going to be shown here.The front of the card is acetate, a super idea - and Pat carefully backed the heart etc. so that it looked perfect from the inside as well! 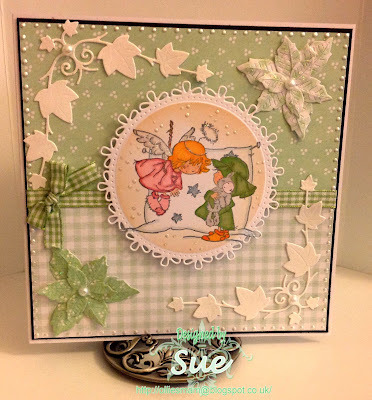 I just love this card, made by Jean! So wonderful how the colours of the background ribbon and the orange layer are perfectly matched to the colouring of the image and that gorgeous butterfly. Which, has some clever touches added by Jean - nip over and read about the antennae! These really cute cards were made by ScrAPamondo's nine year old niece - aren't they just adorable? 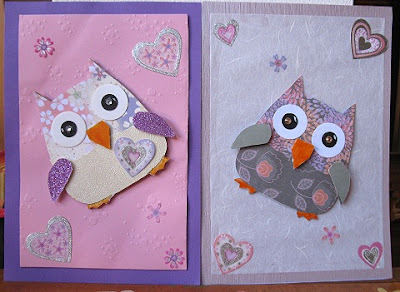 I love the patchwork look to those owls :) And I found out that the little crafter is called Aurora - what a beautiful name! 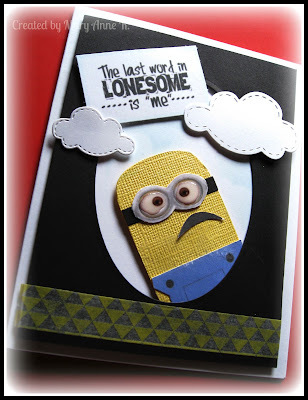 Nate, who is the grand son of Karen (Hasheck) made this terrific Minion card (told you they're popular!) for his - as yet unborn - new cousin. 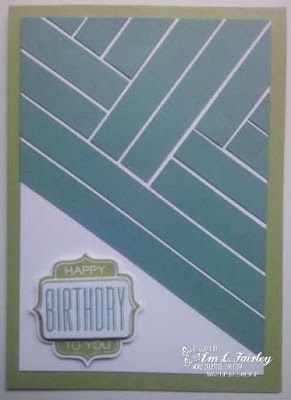 So talented of Nate to make the card in such a clever shape too! I think, but am not 100% sure, that it's also Karen's first trip into the Playground - hope to see you again soon Karen! Jenni hopped in waving this totally stunning card - another entry which literally brought me up with a start this week! It's just perfection isn't it?! And you truly have to hop over to Jenni's and read her funny comment after her hubby asked what sort of person would she send a card to with the lifesaver sentiment on. I giggled for ages over it! And, whilst there, do check out her cards - some wonderful inspiration to be found - so we hope you'll be back to play with us regularly Jenni! And it just shows how random Mr Random is - Helen only began playing with us at the beginning of August (although she did play when Jules was running the snippets challenge) so a nice quick win there kid! Can you please drop me an email with your address and I'll post the punches off to you this week (di_wray@hotmail.com). Yup, it's linked to my snippets card (as is the case when I can manage it) and this time it's a couple of dies the same as I used for little Charlie's card, a Cheery Lynn 'Choo Choo' train die and also a Memory Box 'Modern Landscape' die (which is so, so useful for many cards - fabulous for Christmas backgrounds of course!). 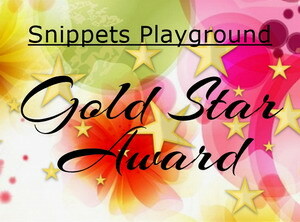 The Snippets Challenge will run for one week and the Playground gates will close at 11am UK time on Saturday 29th August. The gates will open again at midnight UK time on the same day. Maximum of three entries and please say in a comment if you wish to play and be a possible winner of the prize. Also, if you already have one of the dies or aren't really interested in winning both of them but still would like to play for just the one - please say so and if your number is picked as the winner then I'll do a second draw for the other die. And do remember, it's Rudolph Day this week - starts on Tuesday 25th and runs to the end of the month - over at ScrappyMo's, and there's a lovely Memory Box 'Stitched Holly Leaves' die as a prize. I'll be playing as usual - why not combine a snippets card with a Christmas card for Rudolph Day (whisper, after this one there's only three more until the real thing!). Ha! I remembered why I don't use these wooden peg stamps very often, especially this particular set - my OCD side gets the twitches as you feel like you're effectively stamping blind if you are a precision freak like me :( So I only made the one! 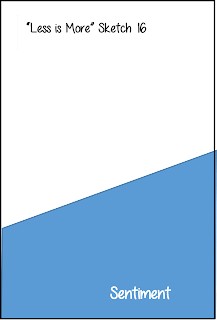 Wow, such a wide brief for this week's theme challenge over at Less is More - 'Congratulations'. Probably one of the simplest cards I ever made! - snippet of black card stock, measuring 2" x 1.5"
- so, I tried my Whispers Markers, much better! I usually just use Memento 'Tuxedo Black' ink with Whispers Markers but found that the Archival ink (which I'd used due to my intentions of colouring all the images with water based Distress Inks) was much better when colouring a whole image, more about this below :) I deliberately kept the colouring a bit patchy/rustic like a few paintings we saw in New Mexico, honestly! Some low down on the Whispers pens. I've had my set of 36 pens for well over 10 years, long before I had Twinkling H2O's, Aqua Markers, Pro Markers or TH Distress Markers. I think they possibly preceded those products in the crafting world, although am not 100% sure of that. They came with their own stand and sit permanently on my desk within easy reach. After I'd made these little cards I Googled 'Sugar Loaf Whispers Strokes' pens and found out some interesting facts. First of all, they're water based! Who knew? I certainly ought to have known as I've successfully used them to colour actual stamps and 'huff' before stamping - so no wonder Memento stamped images had a tendency to bleed if I did much more than just add a tickle here and there. They most probably will 'pill' card stock if you don't work with very light strokes or if you go over the same area more than once or twice, I certainly find this and it applies to even the best of card BTW. Then I went looking to find where the markers could be bought and also the cost of them nowadays. First of all, the cost - from what I could glean they're not readily available and even when I found them in the UK, they can cost about £3 each - more expensive than Pro Markers. I did find what seems to be the same product, marketed by Darice and costing around a dollar fifty each in the USA - quite a difference huh? They can be purchased from Amazon but the reviews are very off putting. The 'pilling' was an issue that invariably annoyed folk (possibly not being gentle enough) but more seriously the quality of the product seems to have totally nosedived :( Peeps were complaining about the flimsy and shoddy construction, the brush ends being frayed and even pens being already dried out when they arrived after purchase! Making these cards really set me off hankering to return to New Mexico where the doors and window frames truly are that wonderful vivid blue in many of the old (and newer) adobe buildings. And the light there is just amazing - an artists dream to paint in 'The Land of Enchantment'. No wonder Barbara Gray loves it there! I've had to manage the Playground all on my lonesome this week, even Parsnip went on strike 'cos he missed Eve :( It's been another busy week with loads of fabulous entries as always. I often have a little smile and wonder if your snippets truly are going down - or are they increasing, like mine? - using a very soft pencil I then lightly drew up a grid of 16 boxes above the sentiment, and also drew lines across and down the centre of each box to be sure of precise placement of the 16 jigsaw pieces (that OCD again! ), then I glued the jigsaw pieces in place using a 'Zig Squeeze and Roll' glue pen. I did make up the design myself, but I subsequently found loads of on-line fun ways to use jigsaw shapes, I'll be trying a few out over the coming weeks. And, the little jigsaw shapes made by using this super little punch do actually link together really neatly - in fact my first play was to make a solid block of the jigsaw pieces but then I decided to space them apart for this particular card. 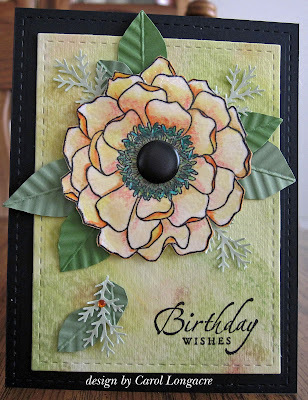 Cathy R made this wonderful card using such lovely MFT dies - and of course plenty of snippets too. I love the simplicity and such a perfect design for a baby with those 'blocks'. How about this beauty for a riot of the most fabulous jewel-like colours, and of course some jewel like gems as well! Made by Jenny L for Mrs A's Butterfly Challenge - where the current theme is washi tape. You still have time to enter as the doors to the butterfly house are open for another 10 days or so. A huge WOW from me when I spotted this fantastic make, brought to the Playground by Diane H. You absolutely must go over to Diane's blog and see all the wonderful detail - plus pointers to show how Diane set about making this gift packet - which she then inserted packets of seeds into for a gardening friend. Brilliant idea! 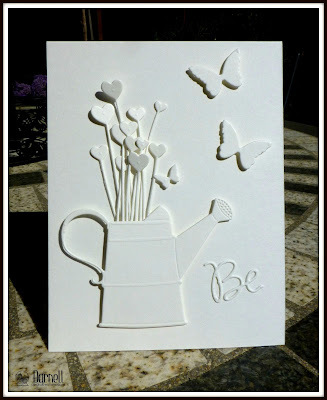 This card is a 'virtual thank you' from Lynn (Lynn's Crafty Corner), for her recent Playground prize. 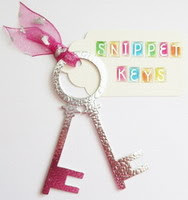 I do so love this die - and the ribbon is such a perfect match don't you think? It was actually a scrap from a package - just shows you should never throw even snippets of ribbon away! I just love this Christmas card, made by Helen. 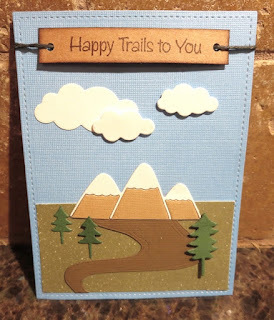 Great little image and such a clever touch to add the faux stitched snippet strips of paper behind it! Great how the red in the patterned paper really makes the polar bear's little parcel on his nose 'pop'. I think this is such a pretty card, made by Ileana. Lots of snippets and some beautiful colouring of the Saturated Canary image. Love how the embellishments (ribbon/flowers) match the image colours perfectly too! This is another card which was also entered into Mrs A's Butterfly Challenge, made by Elly. Great idea to layer the washi tape onto snippets of card stock and if you look closely at the glorious flower there's some wonderful sparkly gold dots to be seen - love it! And last, but by no means least, Eve hopped in with this really gorgeous card. So elegant and I adore all the sparkly silver embossing, a card which just exudes style. It's a young lady named Annie, who is Linda's Grand daughter. We already have one Annie in the Playground so I'll refer to our new Playmate as Pixie Annie - one of her preferred names for the blog she wants to have includes Pixie in the name. Good choice there Pixie Annie, and a really lovely card, love all those flowers and lovely butterflies! Wahoo, Meg's name came straight out (sometimes I have to run the Random Number Generator more than once if it picks someone who doesn't want to be in the pot for the prize) - and what's even nicer is that this is Meg's first Playground win. She first joined in the Snippets Playground in June 2014, so this was more than due! And of course I used my own jigsaw punch on today's card. Both punches have endless possibilities and, even though they aren't exactly lightweight, I will post them to anywhere in the World if the winner happens to live outside the UK. The Snippets Challenge will run for one week and the Playground gates will close at 11am UK time on Saturday 22nd August. The gates will open again at midnight UK time on the same day. Maximum of three entries and please say in a comment if you wish to play and be a possible winner of the prize. Also, if you already have one of them or aren't really interested in winning both of the punches but still would like to play for just the one - please say so and if your number is picked as the winner then I'll do a second draw for the other punch.